Who doesn’t love chocolate and dogs? How about a chocolate colored dog? Well, then you are in luck because today’s handmade card project has both. Imagine challenged the Artists in Residence with three topics to choose from –Aubergine Color of the Month, chocolate and ‘What “wood” you do?’. When I saw a chocolate theme, I chose this fun bulldog stamped image and created layers of chocolate watercolored goodness using some of my favorite ink products. To see how I create this fun card head on over to the imagine crafts blog. On the Imagine blog today with a fun Magenta themed card tying into the colour of the month Maygenta. Hop on over to the blog to see how I created this fun card using my favourite colour combination and inks. 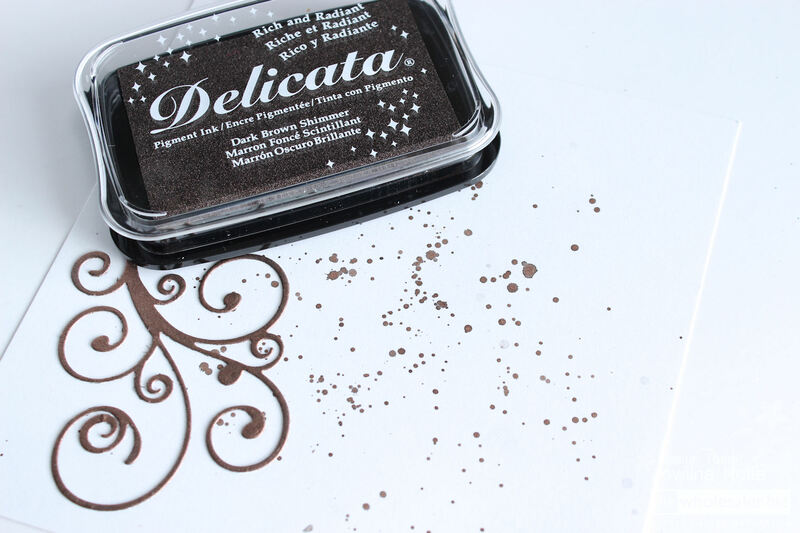 Did you know that you could mix embossing powders together for a custom colour? Did you know that you can colour your white and clear embossing powders? Embossing is one of my favourite techniques – it is always magical and looks amazing. Today I am sharing a quick favourite of how to spice up your plain embossed projects. 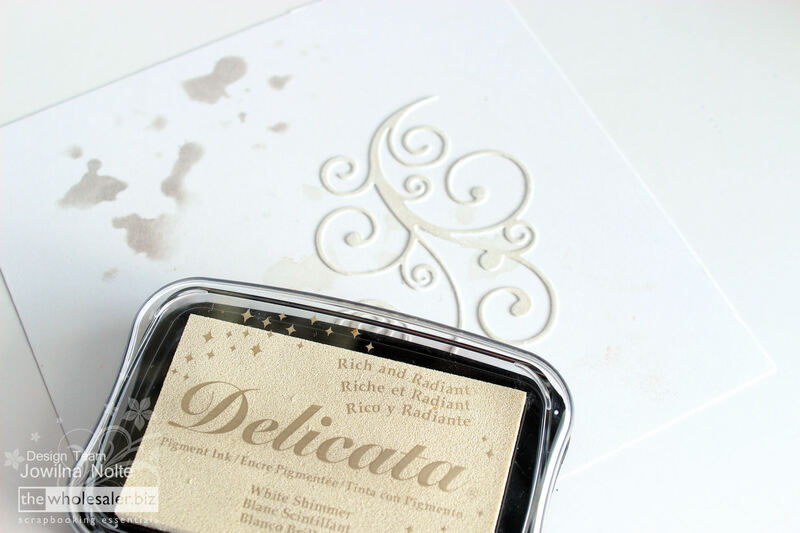 step 1 – Add a single drop of All Purpose Ink into some white embossing powder. step 2 – Mix the colour well into the powder and leave to dry overnight. Sprinkle of this green embossing powder directly onto your project while still damp. Then heat the clumps of wet embossing powder to melt into puddles on your project for a fun look. step 3 – Grab some additional green embossing powders. I was inspired by the image (trend swatch) to find my embossing powder colours. step 4 – Add small amount s of all the colours of powders together in a tub. step 5 – Mix the colours together really well. Use a container that can close and shake it up to mix. step 6 – Stamp your image onto white cardstock using VersaMark ink. step 7 – Sprinkle with embossing powder, shake off the extras and heat set using your heat gun. step 8 – Add some plain embossed circles and some mixed embossed circles together on your next project. I added a variety of embossed circles onto an art journal page. texture and patterns in a variety of shades. For this project I chose to work on an old book and create a journal page with a soft, delicate and romantic look and feel. imagine crafts and Echo Park blog hop. Welcome to the imagine and Echo Park blog hop. Hop along with us and stand the chance of winning some amazing give-aways from imagine and echo park. We are celebrating creativity by combining the wonderful products from Imagine crafts and Echo Park showcasing how well they work together. I created a quick and easy layout – I was inspired by the colors in the paper range as well as the beautiful die-cut. I used a combination of irRESISTible Pico Embellishers and irRESISTible sprays to create a fun background on my layout. Different colors combined to create a beautiful effect. 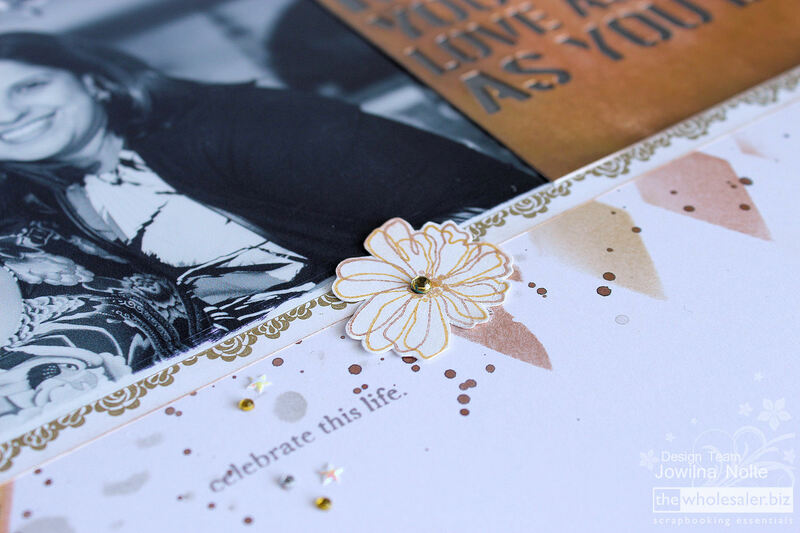 step 1 – Add a stencil design to your cardstock using texture paste and sprinkle with glitter. Leave the paste to dry completely and shake off the excess glitter. step 2 – Spray the background with irRESISTible Texture spray in white across the stenciled design and the background. Leave to dry completely. step 3 – Die-cut the doily out of white cardstock and mist with Yellow Fireworks spray. Let dry. step 4 – Cut a variety of paper strips and ink the edges. step 5 – Create your layout. Adhere the paper strips to the left edge of your layout. Trim off overlapping pieces and ink the edge. step 6 – Layer your photo, die-cut doily, flower stickers from the sticker sheet and thread under your photo. Add the ampersand sticker and additional flower stickers on top of the layers. step 7 – Create colored confetti using punched circles from your scrap papers and a combination of diamante and irRESISTible dots. TIP: Remove the top of the spray bottle from the bottle and carefully splat and drop irRESISTible dots onto your layout. Set aside to dry completely before finishing off your layout. Remember to hop along to all the designers taking part, there are some awesome PRIZES up for grabs! thank you to Echo park for their generosity and stunning products. Next hop on over to the Imagine blog…. Shimmering Tsukineko Delicata, Beautiful Memories. Tsukineko Delicata is the latest generation of metallic inkpad. Remarkably true and bright, it outshines other inkpads and provides stamping results that resemble the true effects of gold and silver leafing without the mess. Yes you heard me, without the mess of using actual foil you can achieve the look of those gorgeous metals in a few easy steps. These inkpads feature a substantially raised inkpad surface to accommodate even the largest stamps without interference from the inkpad case. A Water-based, acid-free and archival ink that is perfect for cardmakers and scrapbookers and any one just feeling the need to add some bling to their creative life. This truly is a remarkable ink pad that can stand on its own but combined with other inks will shine even brighter. 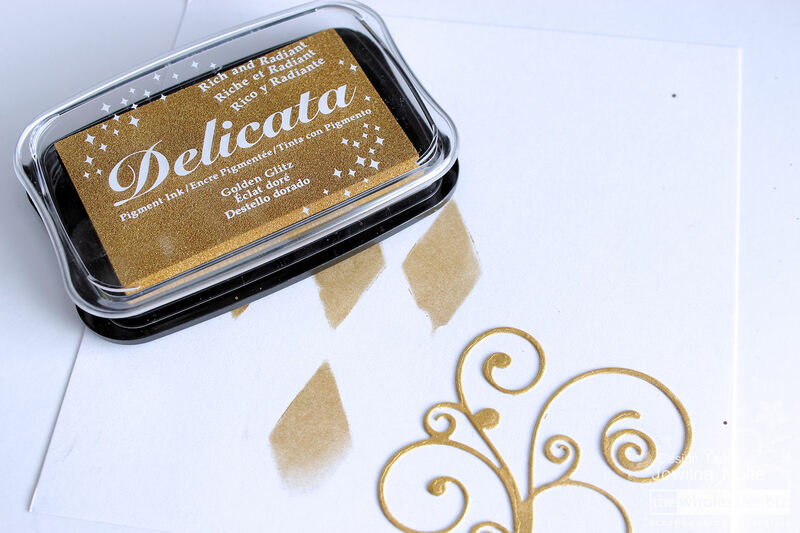 In all my years of stamping and using inks I have never come across another ink that truly shimmers and shines like Delicata. And of course it would be great for the holidays but also for year-round bling. 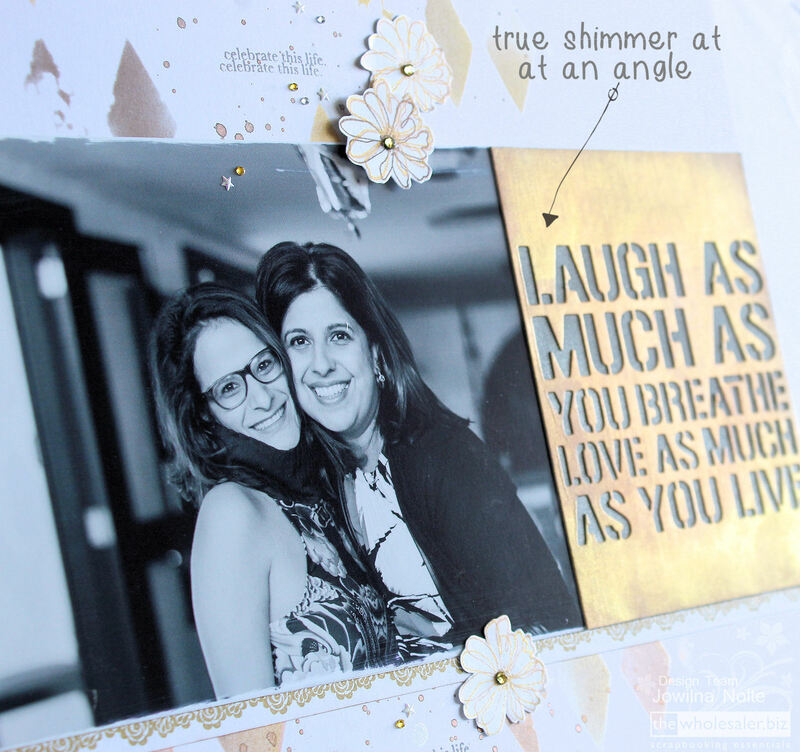 Here’s how I used Delicata to create this gorgeous shining layout. I used the copper re-inker to create a die-cut background. Squeeze a small amount of re-inker onto an old credit card or applicator tool like the lift-off tool and then drag the ink across plain cardstock for an even layer of metallic. Leave the ink to dry naturally. Once dry, use a Kaisercraft die cut and cut out the image out of the inked cardstock piece. Use your ink pad and lightly in a circular movement add ink to cardstock using the direct to paper technique to add Black Shimmer to the cardstock. Leave to dry naturally – (heat setting seems to take away some of the beautiful and incredible shine). Use Golden Glitz Delicata and a stencil and ink a pattern onto the background cardstock. Use a single colour or layer different colours over each other using a clean sponge dauber for each colour to avoid contamination. Leave to dry. Use a second stencil and a clean dauber with the White shimmer Delicata ink pad and stencil another pattern onto the background. Use Silver Delicata and the same stencil with a clean dauber and ink silver over the background for a two tone effect. The white leaves a gorgeous shimmer while the silver gives off a soft glow. Add shimmery ink splats to your background. Press the ink pad onto your craft sheet and mist with water. Use a small paint brush to pick up some of the ink, mix the water into it to make it liquidy and then splat ink onto your background. The ink leaves a beautiful shimmer that is really hard to capture on photos – but truly spectacular in real life. 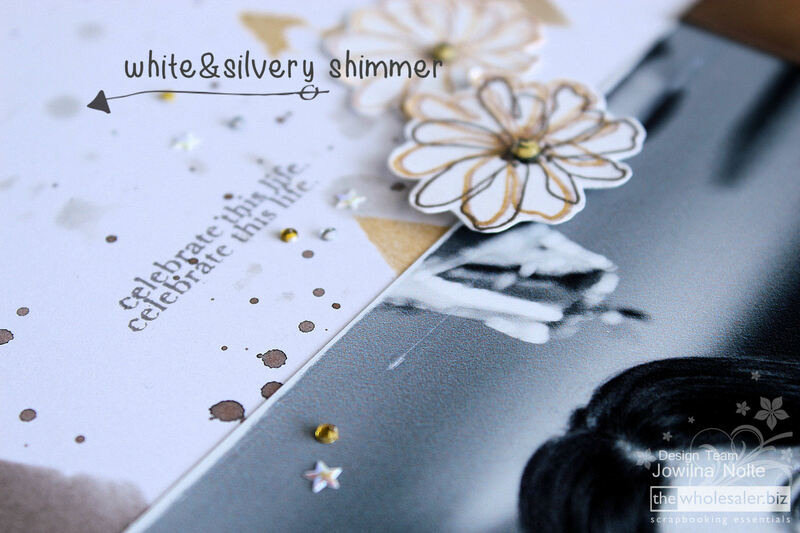 The shimmer and lustre is truly amazing on white, but on black it is even more spectacular – opening up a whole new world for cardmakers and wedding invitations – adding the perfect amount of lustre to any occasion. Get moving – a card in a box for Imagine Crafts. I am on the Imagine Crafts blog with this super fun and easy card with a twist. Sometimes creating a flat card is just not good enough, sometimes something different is refreshing. For today I created an accordion fold card inside a little box. Not only can it be used for the card, you can add a small gift inside for the recipient too. For a full step x step head on over to the blog! I am simply in love with the StazOn Glaze inks – versatile and amazing to work with!